Lauren Santini , and Kyle Ondrey joined Capt Andy and Capt Mike for a quick trip before the start of the long run of trips for this week. Bait is becoming more and more prevalent inside the bays and out in the open water. They had a strong chunk bite in the deeper water that was “lock and load”. They left the striped bass biting to try more spots. 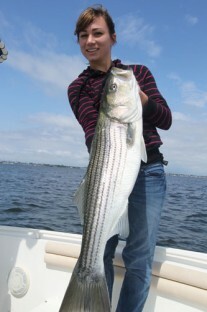 They quickly got into a great live lining bite in the shallows which turned the stripers on to make them feed more agressively and then decided to anchor up and chunk to keep the fish going and it payed off.